Is there any way to set up tags that could be searched? Since I work with cooking/recipes I need to be able to identify and search ingredients, dates, certain comments, meal types, publish dates and etc.. I have set up folders in documents for different foods types and menus but cannot find how to tag them or search the tags. 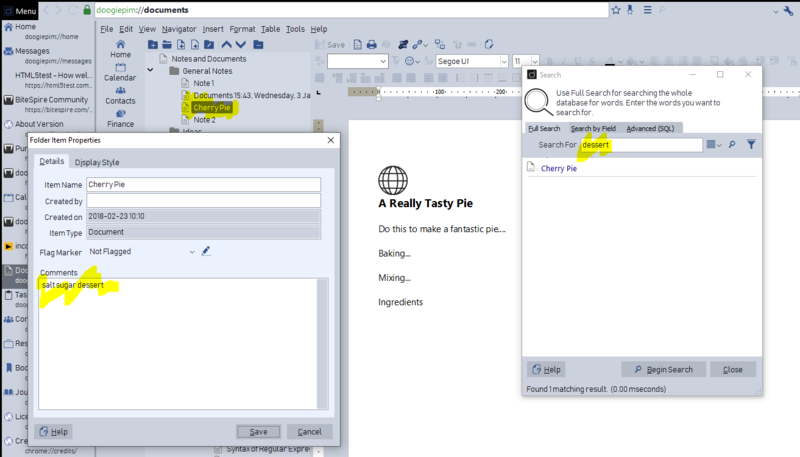 The only way I could see doing this without tags is to somehow set up folders for what I need and then link each recipe but I still would not be able to link the individual parts of the recipe that I would need to see and it would take forever. You could try adding some textual tags in the right-click properties of each Document. The global search indexes any text in those comments too. I will think further on how to provide a better solution but this is the only one that springs to mind. Thank you that sounds like a good idea and I will try it.